Is there a way to generate the calendar with french names for days ? Hi, I'm using this to keep track of my daily to-do list. Would you be able to add an option to have several "to-do" check boxes underneath each day instead of blank lines? Also it would be useful to have a format that has 2 or 3 "columns" across the width of the notebook (i.e. Monday, Tuesday both at the top) so that not as much up/down scrolling is required and more of the week can be seen with one glance. Is there a way that I could make a weekly planner for future weeks, not just the current week? Can this be changed to start the week on a Sunday? Al: One way to do that easily would be to change your computer's date and then run the macro and change it back. Is there a way to prepare planner pages for future dates? Please disregard my previous post. 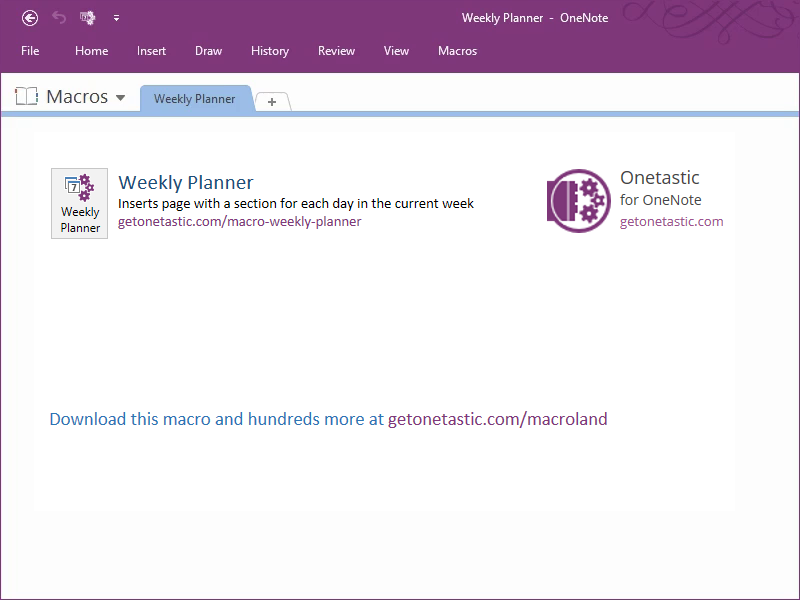 I had an Update for Onetastic available. I installed it and was able to get this macro installed. Great macro for my weekly logs! Thanks! Sounds like a great macro. I was unable to install it getting an Error: Not Found.